The Pamirian Knot was a focal region during the ‘Great Game’ in High Asia. In the aftermath, the mountainous borderland regions became peripheries in their respective countries. 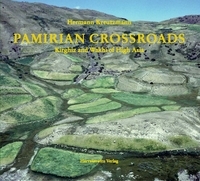 Pamirian Crossroads highlights these marginal borderlands in four neighboring countries – Afghanistan, Pakistan, China and Tajikistan – and analyzes the differentiating effects of imperial designs, colonial boundary-making, political intervention and administrative reforms on people living in a mountain environment. In ecological terms, the similarities outnumber the socio-economic differences in the settlement areas of the Kirghiz and Wakhi, who reside in all respective countries. A diachronic approach presenting the history of exploration and contemporary map-making sheds light on actors and agency, on conquest and mapped desires, on mobility and refuge-seeking. The demarcation of regional borders and international boundaries has contributed to active division and to being divided, to the emergence of places and spaces that are characterized by varying socio-political and economic frame conditions. The mosaic of community challenges, a variety of group and individual responses, experiences of authoritarian pressure and power politics resulting in enhanced mobility and in seeking security in remote refuge locations is spatially connected to Kirghiz and Wakhi settlements in the Pamirian Crossroads. The material presented in this study was collected during a fieldwork period spanning more than three decades, accompanied by archival research and the collecting of historical illustrations along the Pamirian Crossroads and beyond.